I'm continuing my Stash-busting journey this year, and so far so good! I have so many beautiful paper collections that are piling up, and I really would love to use them up before the new trends hit the streets! The paper collection is an older one from Amy Tangerine, and I just love it! I thought it was a perfect fit for photos of our foster kitty Rosie sitting on my hot pink chair. 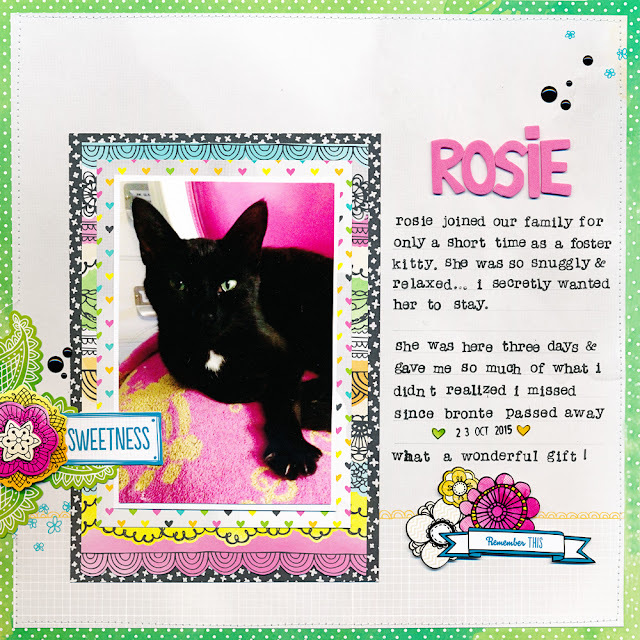 The layout itself is slightly light blasted, as I wanted to be able to SEE Rosie's face! Who knew that black kitties were so difficult to photograph? I sure didn't! The journalling was done with my favourite dollar bin stamp set. I'm not a big fan of my hand writing, so these come in handy. (and I love the look!) It makes a nice change from the typewriters, as I can stamp directly on my layout as opposed to making journalling strips. However, we would do it all over again: she's happy, healthy and so loved in her new forever home.